Dear Internet Trolls, This Woman Will Make You Eat Your Words. Literally. Haters gonna hate. And in no place is that more true than on the Internet. But one woman may have stumbled across the perfect way of dealing with Internet trolls. It involves cake. New York City baker Kat Thek is the founder of Troll Cakes, what she describes as a bakery and detective agency. 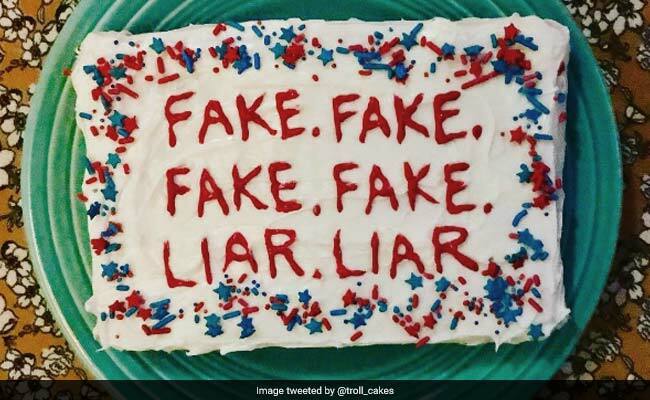 The premise is pretty straightforward: Ms Thek bakes a cake, takes a mean Internet comment or social media post and recreates it using icing and colourful sprinkles. She doesn't even correct typos. The cake is then mailed to whoever said (or rather, typed) it. The cake box also includes a screenshot of the original comment with a message reading: "Congratulations! Your Internet comment has been made into a Troll Cake." Anonymous troll? Ms Thek goes the extra mile by offering to hunt down the troll's address and send it to his or her home or workplace. Ms Thek even offers the "Tiny Hands Special," in honour of US President Donald Trump, and promises the cakes are "bigly satisfying." According to her website, each cake is a dense, moist chocolate chip brownie with whipped frosting and assorted colourful sprinkles and icing. Sounds delicious. The Internet is a "bottomless pit of mean things," Ms Thek tells NPR, but her goal isn't to "cure the world of pettiness." So with abuse fairly ubiquitous online, Ms Thek believes while we may have to live it for the most part, there's nothing stopping us from fighting back - with dessert.